I’m barely done eating these and I already want to make them again! How’s that for tasty? These lightly broiled cauliflower morsels are divine and savory and with just a few spice adjustments could meet both Eastern and Western cuisine flavors. I really want to try a curry blend next time. This served one (me) as I was making it my main course and Jeremy is out of town. Adjust ingredients as you need, whether you are making it a side or main. This was inspired by my favorite kale chip marinade. I thought why not on cauliflower too? Preheat oven on broil setting, about 500F. Combine olive oil, tamari, nutritional yeast, lemon, and cayenne in a bowl large enough to fit the cauliflower too and whisk until combined. Add cauliflower and onion; toss to coat. 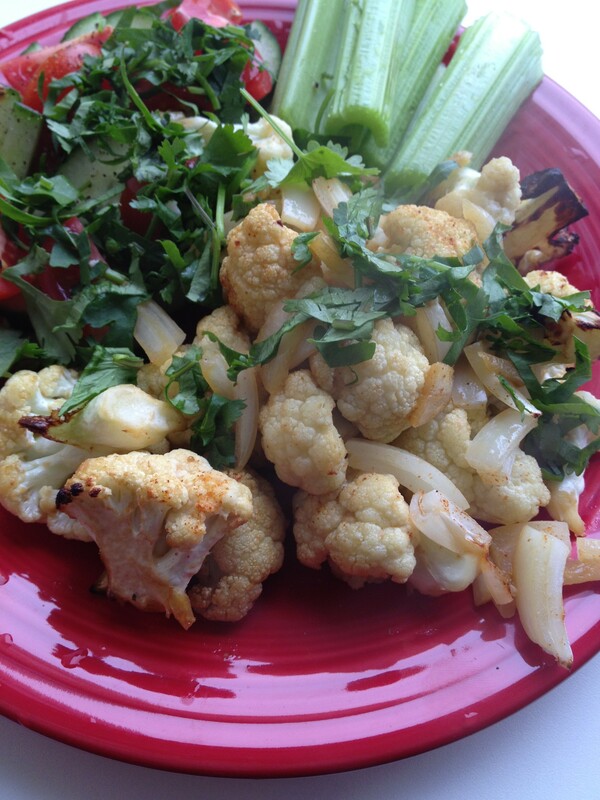 Spread cauliflower out on a cookie sheet lined with tinfoil and broil for about 10 minutes. Sprinkle with cilantro and enjoy! I had it along with slices of cucumber and tomato sprinkled with salt/pepper, and fresh celery sticks. The fresh chopped cilantro really made everything ‘pop’ and I love it, but if you don’t, try basil or another favorite herb. What’s your favorite ‘go to’ marinade?